I got up at the usual time this morning. Getting some coffee, I sat down to drink it and fully wake myself up. Today I wore a khaki skirt we got at Walmart last year and a button-up shirt that was given to me years ago. It's been on of my favorite shirts and I'm saddened that it has been relegated to a work shirt. Daddy and the boys were working on clearing out some of our woods and I decided I wanted to go help. I went down and started raking, but realized if I was going to work then I needed something I didn't mind getting dirty. So I ran up to the house and changed into my denim skirt then ran back down to start working again. 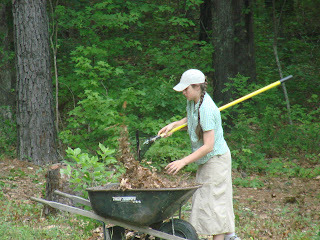 Needless to say, they thought I was crazy to be hauling brush and push-mowing with a skirt on, but it's not impossible. I found it quite easy to work with. Daddy ran out of diesel for the tractor we were using, so he and I drove to Tallassee (the nearest town) to get some fuel. We came back and worked some more. Around 11 am, I walked up to the house for a little break from the heat. I was about to eat some lunch but I noticed that they were about to light the fire, so I went back down to help drag more brush out and throw it on the fire. Finally, we came up for lunch and air conditioning. After lunch, the guys went back to work but I stayed up in the house. I sort of lazed around for awhile (hey, it's Saturday) then Esther and I started messing around. If you don't watch us we get into trouble sometimes. =) Then I read for a little bit. In the late afternoon, Mother started getting supper ready while I finished something I needed to do on the computer. For supper we had fish sandwiches. Quite good. Mother had made a pound cake earlier in the afternoon and that was dessert. Mom makes the best pound cakes. After supper, I cleared the kitchen while some of the kids got cleaned up. I felt really dirty after working outside (and sweating buckets), so I took a quick shower as well. I had brought home from the library, the movie Great Expectations and we watched the first volume of that (there are three). After that it was time for bed. I sat in bed reading for a while before lights out. Yes, you can definitely work outside in a skirt, as long as you don't mind it getting dirty. =) After all, think of all that the Frontier women did! I'm glad you had a relaxing Saturday afternoon! Yes, it is possible to work outside in a dress/skirt, but sometimes it is not advisable. 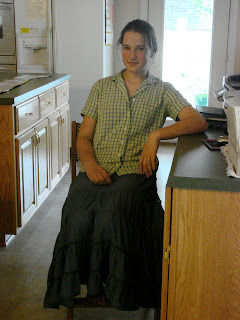 Also, on very windy days skirts can reveal a lot more than a modest woman would want to reveal! 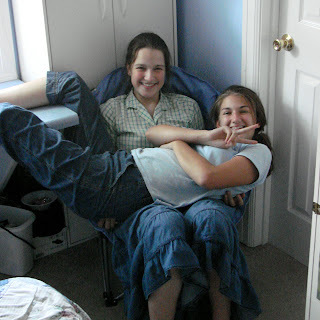 I remember when my sister and I convinced my mother to do her yard work in some loose pants. My mother was hoping that we were the ONLY ones who saw what we saw! Wow! I have to applaude you working out doors in a skirt. I would be a little fearful of it out herre. The wind blows all the time, and though I haven't had a disaster, it can happen! Mrs. Hart: It is true, that there are some situations where it would be more immodest or dangerous. It hasn't happened to me, but thank you for sharing your experiences so that we can have a more balanced view. I tend to be too extreme in some cases, and need constant reminding of other views sometimes. =) Often, if I have any doubt, I wear shorts underneath just in case. My sister Miriam got horridly stung multiple times once from bees flying up her shorts - other items of clothing trap bugs as well. Wisdom should dictate, you are right. > Getting some coffee, I sat down to drink it and fully wake myself up. I'm enjoying this series thanks for posting! I don't remember what version of Great Expections we watched, but it was an old black and white. I was curious to see it after reading about Miss Havisham, and I think it was a decent version.